I did not like school. I liked to learn, but I did not like school. Most of the time I was bored and disinterested. My body was present in the classroom, but my mind was far away. I did like learning what I considered useful and practical. Subjects like math and mechanical drawing I found interesting. Until I entered Georgia Tech, I was confident that I would be the next Frank Lloyd Wright. Why should an architect be bothered with English, social studies and that sort of material? In addition to being disinterested, I thought the teaching methods were too rigid and required too much rote memory rather than creative thinking. As a result of my attitude, I did not earn good grades. I did not like school. I loved! Algebra! It made sense to me. It was practical. I had no trouble understanding it. For Algebra, I was all-in! During the first quarter, on every test, I received a perfect grade of 100. On every classroom assignment and every homework assignment, my grade was 100. I visualized taking my report card home at the end of the first quarter and showing my parents a perfect score, 100! I was totally disappointed and discouraged. Mrs. Kathleen Dolphin taught me more than basic algebra; she embedded an important lesson in the mind of a cocky, rebellious and uncooperative teenager. It is a lesson that I have never forgotten. I learned that it didn’t matter who kept the score or whether they kept it correctly. It didn’t matter whether I got credit or recognition. What mattered was that … I knew … I had done my best. I didn’t like Mrs. Dolphin’s method, but I treasure her lesson. 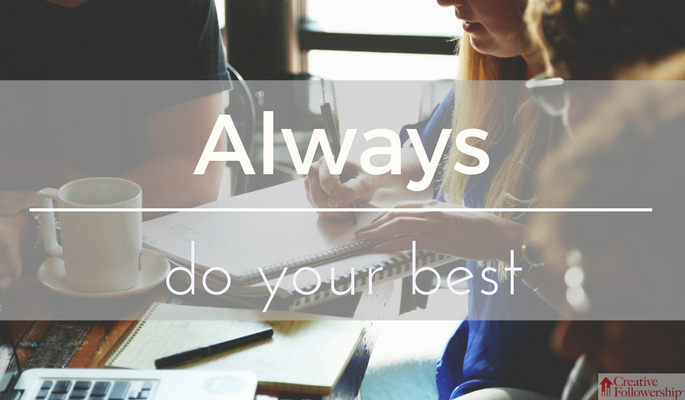 Always … Do Your Best! For almost 64 years, I have heard her speak to me. Thousands of times I have heard her voice and still hear it today. I did want to amount to something, and I slowly learned to follow her advice. Subscribe today and receive access to our FREE Followership resources, early notification of eCourses and new workbooks, as well as a monthly newsletter with more actionable tips to grow in both leadership and followership.